This fantastic Fiberglass Oven Basket gives all round crispiness to your food. ensuring that air will circulate when cooking to allow for perfect crisp food every time. Sits directly onto oven shelf allowing air to circulate around your pizza ensuring crispy bases everytime ! and crusty and the food does not have to be turned during the baking process. pans,cake tin , can be used when cooking , roasting , grilling , baking , frying. The heathier cooking invention that simply works , cook your food in its own juices, ensuring the food is low in calories and retains its vitamins . 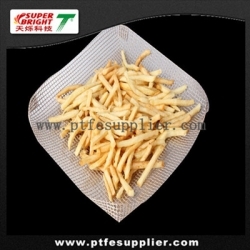 1.Non-stick Fiberglass Oven Basket Cooking crisp food, meat, fish in oven, microwave oven, pan, BBQ grill. 2.Drying machine for non-woven textile, textile printing, silk-printing and dyeing machine. 3.Shrinking machine for garment fabric, high-frequency and UV dryer. 4.Hot-air dryer, various of food baking machines ,quick-frozen machines. 5.Oiling machine for paper glazing and waxing, plant engineering.